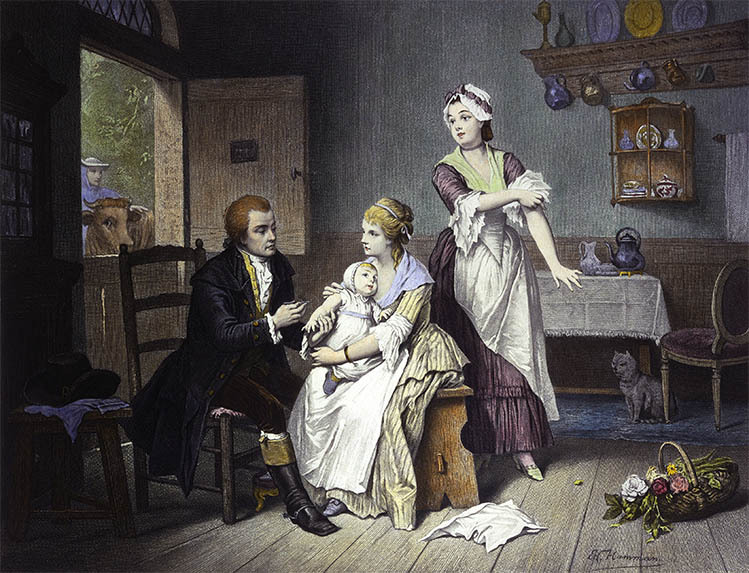 Edward Jenner vaccinating his young child, held by Mrs Jenner. Credit: Wellcome Library, London. Surely this must resonate with us in light of the present controversy over vaccination and I wonder whether over 200 years since his discovery he would still regret how some feel. A doctor in London, Edward Jenner, is in the process of bringing a new discovery to the fore of the scientific community and the tide of war is about to change. 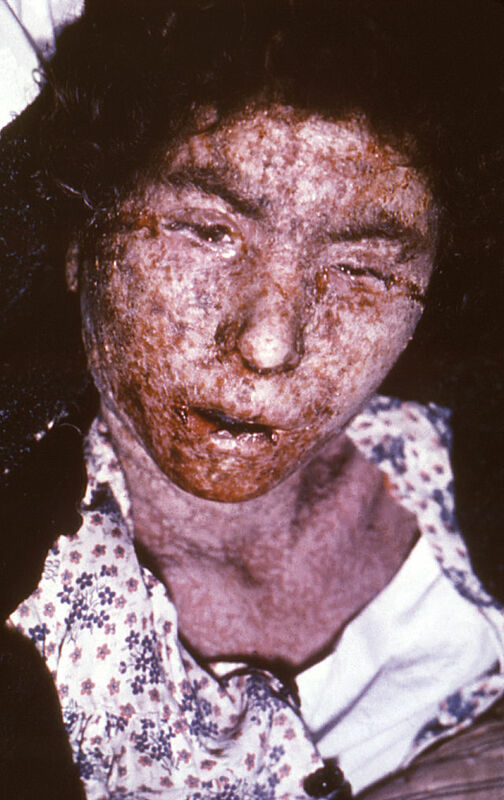 At this time the defense against smallpox was known as variolation, a practice that dates back to 16th century China, where scabs of smallpox patients were collected, kept for a time, crushed into a powder and blown up the nose of those yet to get smallpox.5 The reason an individual would be deliberately infected with smallpox in this way was because the mortality rate of 20 – 30 % dropped to 0.5 – 2 %.6 These odds were preferred. Variolation was also practiced in Asia and Africa before spreading into Europe and the Americas. In fact, in Boston it was a slave by the name of Onesimus who told his master Cotton Mather he had been protected against smallpox in Africa and that it was often used among the Guramantese.7 This started Cotton Mather on his journey to introduce the practice into north America. Variolation was not without its risks because for every 100 inoculated, 2 or 3 would die from the disease and anyone naturally contracting smallpox from those inoculated would be at a more severe risk of death. One of America’s greatest intellectuals, a preacher, theologian and missionary called Jonathan Edwards (grandfather of the 3rd vice president of the United States) strongly supported smallpox inoculations and despite the risk, was himself inoculated in 1758. His health was not strong enough and he succumbed to the smallpox disease and died.10 The inoculation was far from ideal. When inoculating a person Edward would typically scratch the surface of their skin and rub in powdered scab or fluid from the pustules of a smallpox patient. However, he curiously noted that some people were resistant to his attempts to give them smallpox, despite never having had the disease before. He was not alone in this observation as there are records of a number of other men studying this interesting phenomena. Those who were resistant were from the countryside and a higher percentage of them happened to be milkmaids (young girls who milked cows). He suspected this was due to a disease of the cow known as cowpox, as others before him had also thought. When infected, the milkmaids typically reported sores on their hands and feeling under the weather for a week before returning to normal. 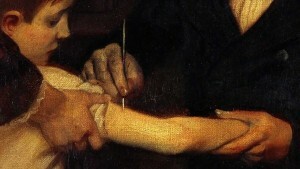 Oil panting of James Phipps being inoculated with cowpox. by Edward Jenner. Painting by Ernest Board. Credits: Wellcome Library London. One day a milkmaid named Sarah Nelmes came to Edward concerned that she had smallpox but he correctly diagnosed it as simply cowpox from her master’s cow named Blossom. She had become infected after scratching her wrist with a thorn and the open wound coming into contact with the blisters on the cow. Edward seized this opportunity to collect some pus from her sores and inoculated a young boy named James Phipps, the son of his gardener, with it on the 14th May 1796. But now listen to the most delightful part of my story. The boy has since been inoculated for the small pox which, as I ventured to predict, produced no effect. I shall now pursue my experiments with redoubled ardour. Edward Jenner saw a future without smallpox just as many today see a future without measles. In 1967 the World Wide Health Organization pushed ahead with Edward’s vision to eradicate smallpox by vaccinating as many people as it could against smallpox and hunting down outbreaks. 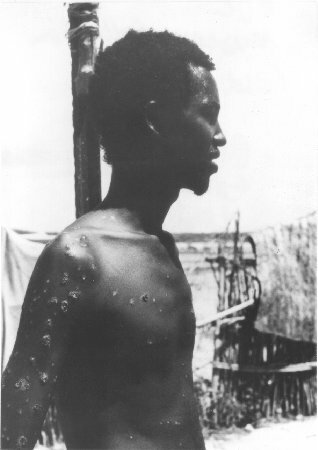 Finally in October 1977 the last person with smallpox was found in Somalia and everyone around him vaccinated. The virus, unable to replicate outside of its human host, had no-one else to infect and finally ceased to exist in humans. Apart from one lab incident in 1978 there hasn’t been a human infected with smallpox since.17 It has been eradicated as a disease and vaccinations subsequently stopped as they were no longer needed. Mankind’s war of Independence from smallpox had finally been won and Edward Jenner’s vision realised. We can do the same with measles because it, like smallpox, is unable to replicate outside its human host and we have an effective vaccine. I look forward to a day when measles vaccinations are no longer needed, just like we now no longer need smallpox vaccinations. For this to happen we need measles vaccination coverage to remain high. From 2000 to 2013 vaccinations caused a 75 % reduction in worldwide measles deaths saving an estimated 15.6 million people. However, 145,700 people were still killed in 2013, the majority of which were children.18 There is some way to go. Let’s work to ensure future generations have a measles free world as generations before us worked to ensure we have a smallpox free one! 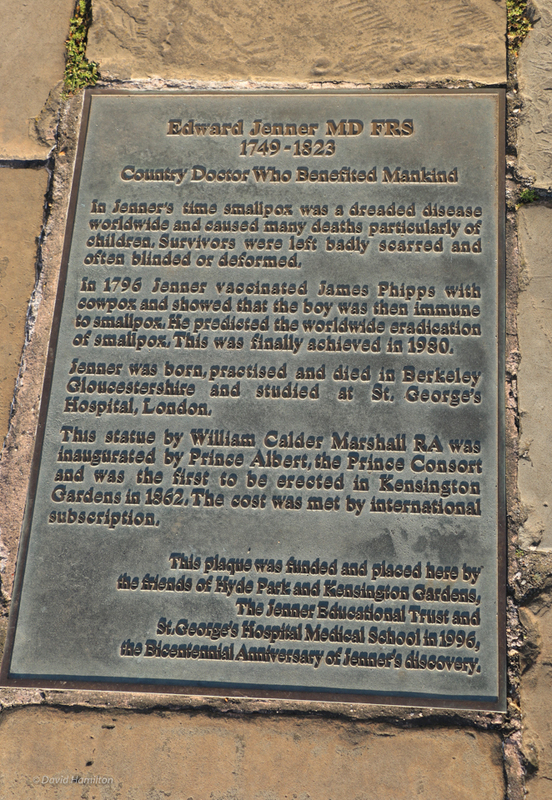 The plaque commemorating Edward Jenner can be found in Hyde Park, London. Click to read. As to what became of the cow, Blossom. Well, I’d like to think she had a happy ending as she was probably obtained by Edward Jenner. Her hide was donated by the Jenner family in 1857 to St George University of London, so the next time you are in that area why not go and see her in St George’s medical school library! 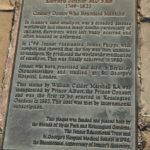 If you take a walk through the famous Hyde Park make sure you visit the Italian Gardens where you will see a statue of Edward Jenner and a memorial plaque commemorating and honoring him. I stood for a while amongst the bustle of people and remembered what he did for us all. All should know his name. 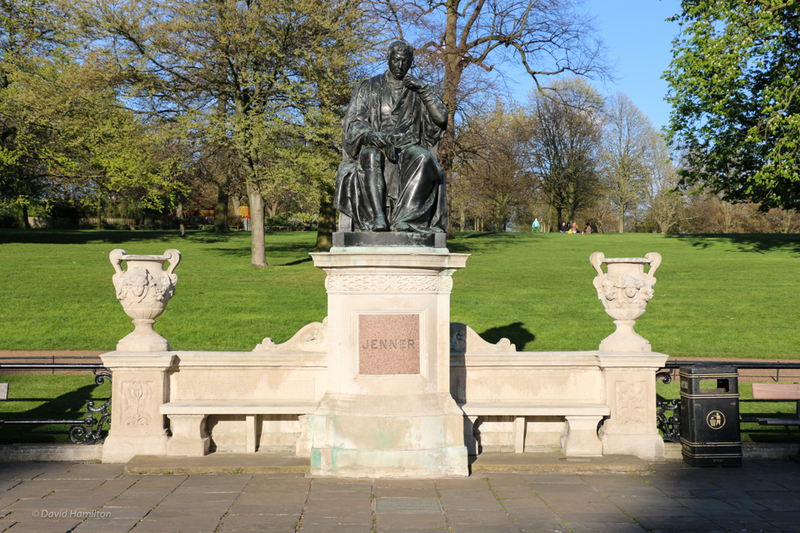 The statue of Edward Jenner in honor of his acheivement for mankind can be found in Hyde Park, in the Italian Gardens. A short post on our forgotten past before vaccinations and what we have forgotten to teach our children. Koplow, David A. 2003. Smallpox: the fight to eradicate a global scourge Berkeley: University of California Press. Behbehani, Abbas. 1983. The Smallpox Story: Life and Death of an Old Disease. Macaulay, Thomas B. 1848. The History of England from the Accession of James the Second. Volume 4. Leung, Angela K., 2011. “Variolation” and Vaccination in Late Imperial China, Ca 1570–1911. Mather, Cotton. 1716. Curiosa Americana continued in Letters to Ye Learned & Famous John Woodward M.D. F.R.S M.Profess. from Cotton Mather. In Ye year 1716. Sloane MS 3340 No. 10 (fol 293b-297). Barquet N, Domingo P. 1997. Smallpox: the triumph over the most terrible of the ministers of death. Ann Intern Med. 127(8 Pt 1):635-42. Jenner, Edward. 1801. On the origin of the vaccine inoculation. World Health Organisation. 2010. The Smallpox Eradication Programme. Looks like snorting the actual virus was the thing to do and originated back in China. I am curious, how did Edward Jenner administer the cowpox virus? Thanks for commenting Sozoed. It is interesting that different cultures developed slightly different ways of dealing with smallpox. In China it was snorting the material from smallpox sores and in Africa it was making a cut on the arm and rubbing in the material. In Turkey it was the African method that was used (perhaps because Africa was closer than China) and this was the method that spread in the west. Edward Jenner was used to administering the smallpox material by scratching the arm and so he kept the same method but used the cowpox material/fluid instead. If you google ‘bifurcated needle’, you’ll see the modern instrument used to scratch the surface to administer the vaccine – this was used until smallpox was eradicated. For this particular vaccine the method chosen to administer is applying it to the skin. Why not bypass the skin and inject like many vaccines today? Did Edward Jenner administer any other type of vaccine? Do you know if Edward Jenner charged for his services? That’s strange you didn’t get a notification. Check in your junk mail and if there’s nothing there let me know as the problem must be at my end. Vaccines today are given by 3 routes, intradermal, subcutaneous and intramuscular. Intradermal (in the layers of the skin) is the route of the smallpox vaccine because it was a live virus and efficiently spreads on the skin. So getting the virus into the skin causes the infection faster and subsequently an efficient immune response. Not all vaccines contain live viruses and hence the method varies depending on what gives the best immune response. If you read that page on the method used then compare it to this intradermal BCG vaccine method ( https://www.youtube.com/watch?v=zTX2dXJekx0 ) and imagine the time it would take to vaccinate 200 million people across the world in this way, the cost of the syringes and extra amount of vaccine etc. The bifurcated needle was cheaper, faster and just as efficient. I don’t believe Edward Jenner charged for the vaccinations as he was given a grant by the British government to carry on the research into the vaccine. I do know he didn’t try to patent it but made the information freely available. I’m sure other doctors charged for their services and this was probably what led to the 1840 vaccine act making the vaccination free as none of the poor were getting vaccinated. Later on the British government actually made the vaccination compulsory. Edward died in 1823 and the next vaccine wasn’t discovered until 1885. That was the rabies vaccine. Next story How do vaccines make us immune?